To the uncritical eye, Raymond would be remembered only by the bright copper-red of his coat. A wiser individual would recognize him for what he is: either a powerful ally or a dangerous foe. He has a slender, sinewy build, and carries himself with the measured restraint of a viper coiled to strike. His martial upbringing is carved into the intentional way that he moves, the sheer economy of motion. His mane is sparse where it grows at all, and he keeps it cropped close to his crest. He has a long, dexterous, leonine tail reminiscent of a unicorn. Also reminiscent of a unicorn, he has a single horn, but very much unlike a unicorn his horn grows at the end of his tail in the form of a wickedly sharp scythe. Now the obsession with precision makes a bit more sense, eh? Raymond's tail blade is not just for show. Maintaining its deadly edge is a matter of racial pride and maintaining his edge is more of a matter of personal pragmatism. Raymond has spent the better part of his adult life alone and prepares for the worst case scenario. If his charm cannot get him out of a tight spot, his combat skills will. Raymond is an observer, first and foremost. While not quiet by any stretch of the term - often he speaks first and longest, and enjoys engaging others in conversation - he views interaction as a tool to gain information or persuade others. He will wring every ounce of value out of empty chatter and put it to use if he can. He has a well-developed sense of humor and uses it often, which makes the rare times he loses his temper all the more shocking when they occur. He is affable as often as he can be and treats others with genuine respect until they prove themselves unworthy of it. As far as Raymond is concerned, the importance of one's political station is either completely unrelated to or negatively correlated with the respect that they deserve. He enjoys giving gifts to those he cares about, and is pretty good at remembering things about other individuals even if he's only met them once. People are important to him, even if he keeps very few of them close enough to potentially hurt him. Raymond keeps a cool head, doesn't spoil for a fight, and generally won't willingly get into combat unless he has no other choice or has already guaranteed a positive outcome for himself. He adheres pretty strictly to the measure twice, cut once school of thinking and isn't afraid of speaking frankly with others. He is what one might call a voice of reason. This restraint, patience, and prudence are seen as necessary because when he does get tilted he tends to tilt off the face of the planet and will stop at nothing to destroy or dismantle who- or whatever has wronged him. He has a strong sense of personal justice but little patience for any concept of law and order, so his methods of achieving what he deems to be right can become quite grey at times. Having been burned by the establishment once, he would prefer to defer to his own standards and principles, and views reason as the most potent tool for determining morality. He values loyalty above all else and does not break ties lightly. As such, he still views Calliope as his queen despite them having left both her kingdom and her throne long, long behind, and will go to great lengths to assist or defend her. 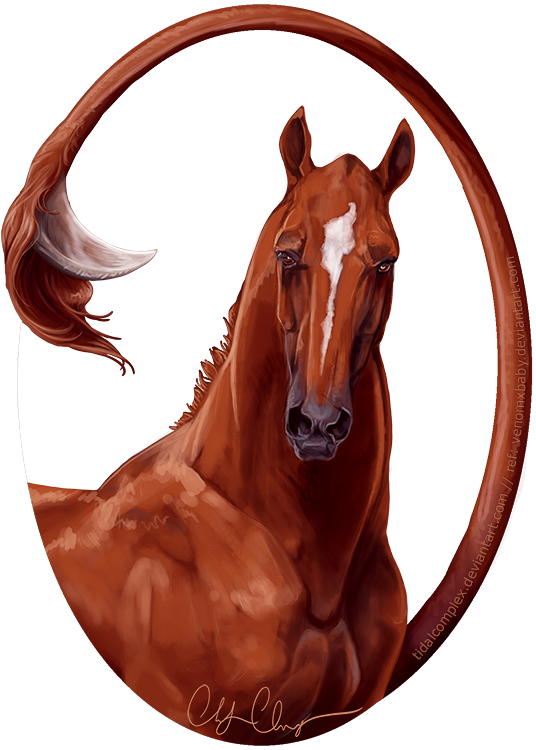 While exactly what Raymond is is far less important than who he has become, it might be beneficial to know that he began his life as a respected yet unremarkable member of a tribal race called rendari horses, which were known for their brightly colored coats, bladed tails, and fierce dispositions. The rendari took pride in their rituals and discipline - a necessity in a society where even the very young carry weapons - and Raymond would have lived and died as a defender of his clan but for the cruelty of ambition. Where some preferred to lend their strengths toward conquest, the dal'rend of Raymond's clan hoped only for peace and prosperity among his people. Neighboring societies made far better allies than victims in his eye, and years of honest toil had carved out a stronghold and a budding diplomatic network with other rendari clans and foreigners alike. But some among the clan thirsted quietly for the glorious tales told of blademasters and bloodshed from the days of old. They chose to practice their new ethos first upon the dal'rend and those who shared his vision, murdering them in their sleep before they could raise the alarm. For the last time in his life, Raymond was blinded by his own naivete. Only a warning from the lips of a dying comrade spared him from the same grisly fate. Faced with the prospect of a valiant, suicidal charge against the usurpers, Raymond was forced to flee. After that day, he seemed to disappear as far as the clan could tell, and the fate of one wounded exile was no bother to them when there was conquest to be had. But the new dal'rend would find as they worked to cement their power that the wilderness suddenly seemed more treacherous for his war parties; allies dried up like water in the desert. Strangers anticipated their tactics and thwarted them more often than not. The rituals that had kept them and their blades keen and ready for generations were suddenly a crippling weakness. Raymond moved on only when word came that the new dal'rend had fallen, his stronghold left for the carrion birds. He carried nothing with him but himself - every trinket his words had bought traded away again just as quickly, every drop of blood spilt to further his cause left to stain only his memories - and the lessons of his ugly work. He watched everyone with the distrustful scrutiny of a hungry dog and exploited their strength to fortify his weakness. He fought with information where his tail blade could not hope to reach. Honor was a child's fantasy. Even the sacred traditions of his people were not too high a price to pay for justice. He could never show his face among the rendari horses again. With no home of his own Raymond did what any self-respecting outcast would do and started walking. Various shenanigans ensued - none of which are collectively important, except to say that they happened and served to propel him forward in his own narrative, hardening him against such fancies as hope, charity, and law - until he arrived at Ravos. It was full of all the intrigue and dangerous tribalism that had done him so poorly in the past, but the land was steeped in strange magic and preyed upon his curiosity. It was then that he met Calliope. She was more beast than unicorn. He offered his strength to her cause at first by the sheer ballsiness of her pitch, but grew respect the honesty of her savage elegance and her reckless pursuit of a sort of justice he understood well. The allegiance he had meant to give as a means to obtain leverage for himself grew into proper loyalty the better he came to know her. When the rift called them to leave Ravos and Velius behind, he did not hesitate. But the rift was a vicious thing. He arrived to find Shrike - Calliope's closest companion - dead, and Calliope herself mad with vengeful fury. Only the cool logic of his own harsh lesson, now long past, was sufficient to calm her bloodwrath. But she was not one to be harnessed and led by well-placed words; she was a roiling sea in a tempest, depthless passion and terrible conviction. He might save her life by soothing her rage, but nothing could turn her from her hunt. Accompanied by his new companion Ruth - a strange hairless kitten found near death in the western riftlands and nursed back to health by Florentine - Raymond returned to Velius, to the seat of Calliope's once and future power, and returned with a silver cuff he had forged both as a focus for her power and a token of his loyalty. He developed a strong bond with the spirited kitten on their shared journey, though he would never have admitted his fondness for her out loud. Instead he poured all of his remaining spellforging power into the delicate sapphire-adorned collar she wore. The enchanted collar would protect its wearer from virtually all harm, both physical and magical, thus ensuring her safety. Together they returned to the Rift, where he presented Calliope with the token from her lost kingdom. When the rift fell to ruin, Raymond left with her, but not without cost. This time, as they crossed through the tumultuous Rift, Ruth lost her grip on his back and was torn loose, tumbling deep into the heart of the rift. Harkening back to his days in the wild lands of Ravos, Raymond has rediscovered the ability to dampen and sometimes even reflect magical effects by others. These wards do nothing to hinder natural physical attacks. At its most basic level, Raymond's spell warding ability grants him basic awareness of passive magic around him, though not necessarily its source as well as the ability to conjure a ward around himself that will dampen the effects of a magical attack (mind control, fireballs, lightning bolts, mood alteration, etc) cast by a Tier I spellcaster. Dampening the impact of active magic will quickly tire him out. Should he attempt to block spells from a Tier II ability or higher, the spell ward will break and he will immediately become exhausted, the effects of which increase with the power level of the enemy attack. what is a mob to a king? Raymond's mastery of spell warding has improved, allowing him greater accuracy in identifying the caster of a magical ability. He now also has the ability to conjure a ward around himself that can completely absorb the effects of Tier I magical attacks with no harm to himself, and can dampen the effects of Tier II magical assaults. Shielding himself from magical harm will still eventually cause him exhaustion, but it takes far more for lower level attacks to drain him. If he attempts to block a direct attack cast by a Tier III (Periti) spell caster or higher, the ward will break and he will immediately become exhausted, the effects of which increase with the power level of the enemy attack. Raymond has achieved a greater understanding of spell warding. He can accurately sense a creature using magic even from a good distance away, and is now able to shield himself completely against magic from a Tier II spellcaster or lower. With his greater mastery, he has modified his wards to actually be able to reflect spells back at their casters with equal power (If a Tier I horse casts a fireball at him, it will be reflected back at Tier I strength). He is also now able to dampen the effects of both direct and environmental magics (such as weather, light, earth magic that affect the area around him rather than him specifically) cast in the immediate vicinity of his person. It now takes resisting a much greater amount of Tier I and Tier II magic to tire him, though dampening Tier III magic can exhaust him. If he attempts to ward himself against a Tier IV attack, the ward will break and he will immediately become exhausted. what is a god to a non-believer? Raymond is now a true master of spell warding. He can block and reflect attacks cast by magic users of Tier I-III with ease including environmental affects (such as earth, light, or weather manipulation), and reflected attacks are rebounded upon their casters at Tier IV strength. His wards can now dampen the effects of both direct and environmental Tier IV magic, and he can now cast those wards upon other nearby individuals as well as himself. Attempting to maintain more than his own ward in combat will tire him out in addition to the limits of dampening Tier IV magic. Once, Ruth was a little calico runt of a Sphynx kitten, with vibrant mismatched eyes and an inexhaustible sense of adventure. She had survived two trips through the Rift and perhaps felt untouchable because of that. However, when Raymond attempted to bring her through the rift one last time to Novus, she lost her grip on the stallion's back and tumbled into the heart of the rift. Raymond gave her up for dead, for none can survive such horrors unscathed. Protected from death by a powerful enchantment on the collar she wore, Ruth was not slain, but nothing could spare her from the rift's chaotic power. It warped her, mutated her beyond recognition, and delivered her after a tortuous journey to an altogether alien world, remade in the rift's image to visit apocalyptic destruction upon all who called it home. Once her grisly work was finished, she slept for the greater part of a millennium, until a strange familiarity pulled her back through the rift... Back to Raymond. The helpless kitten that he found and Florentine healed is gone. All that remains of the bright-eyed Sphynx is exactly that: her eyes. The right is bright, icy blue while the left is yellow as forge-fire, glinting with the vestiges of her lost innocence. Her body, however, has become truly monstrous. 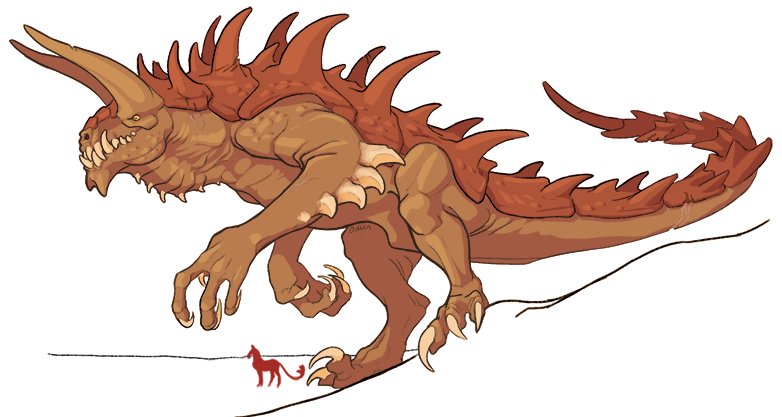 She is absolutely massive, a titan known amongst the storytellers of her temporary home as an apocalypse machine - a Tarrasque. Even her mighty talons would dwarf the stallion who raised her from kittenhood. Her head is vast and blocky, with a pair of heavy horns jutting aggressively forward from her brows, and a mouthful of sharp, jagged teeth. She stands on muscular hind legs and keeps her long, dexterous, spiked forearms curled at her sides. From nose to tail-tip she is covered in a thick, scaly hide and am even thicker carapace, both riddled with the scars of past conquests and highly resistant to any magical assault. Her long, armored tail can lay waste to townships and fortifications alike. While she cannot fly (of course), the Tarrasque is an exceptionally powerful leaper - there are few obstacles she cannot scale at a bound, and those obstacles she is able to climb with her powerful arms and legs or simply destroy. She also possesses powerful regenerative abilities, which accelerate healing when she is injured. For a thousand years she has known only destruction, but buried somewhere inside her scarred visage is the memory of red, and of a kindness paid.